Home » General Health » Sleep Deprivation: Eat Your Way to a Good Night’s Rest! We all know that you shouldn’t be drinking a cup of coffee right before bed because it will keep you awake and result in sleep deprivation. Well, what about foods that will do the opposite and help you fall asleep faster and more easily? Are you suffering from insomnia or sleep deprivation? You are not alone. Over 60 million Americans suffer from insomnia, and those numbers are steadily climbing each year. There are different triggers that may lead to sleepless nights, such as stress, environmental factors, and even food. Few people realize just how debilitating sleep deprivation can be. Sleep is what keeps us going—it is nourishing and restorative, almost as crucial to life as air, water, and food. Most people who suffer from sleep disorders reach for a pill, which can come with some pretty horrible side effects. Wouldn’t it be nice if there was a way to go to sleep naturally, actually stay asleep, and wake up in the morning feeling refreshed? What if I told you there is a simple way, and it involves things that you already have in your kitchen cupboard? As a nutritional therapist, I look to food to help heal the body from many diseases and disorders, and insomnia is no different. Many research studies conducted on the effects of food on sleeping patterns offer a bright outlook for insomnia. Tryptophan is an amino acid that stimulates the production of serotonin, which is a neurotransmitter in the brain that helps calm you down and makes you sleepy. Everyone knows about the tryptophan in turkey that makes us fall asleep after a big Thanksgiving dinner, but did you know that lobster and shrimp may also bring easier sleep with their high levels of the amino acid? So do eggs, cheese, and nuts. Try to incorporate these foods into your dinner or late-night snack to help make bedtime more relaxing. According to research from the University of Pennsylvania and University of Rochester, a glass of tart cherry juice could help you fall asleep faster by naturally boosting your levels of melatonin, the hormone that controls sleep. Ginger and tomatoes are also excellent sources of melatonin that can help with sleep disorders. Melatonin is also available in supplement form, so it can easily be taken before bedtime to help you get a better night’s sleep. Research has also shown that drinking a cup of chamomile tea helps with sleep. Drinking tea is associated with an increase in glycine, an amino acid that relaxes nerves and muscles and acts like a mild sedative. I know that just holding a nice, warm cup of tea makes me feel relaxed and ready to sleep! If you can get to sleep just fine, but wake up at 2:00 a.m. and are unable to get back to sleep, then food may be your solution as well! Studies show that consuming fat is satisfying and gives a slow, steady supply of glucose to the brain, which shuts off the disturbing release of noradrenaline, allowing you to get back to sleep more easily. So when you wake up in the middle of the night, try eating a few spoonfuls of plain yogurt or cottage cheese made from grass-fed cow’s milk mixed with a few low-glycemic fruits, such as strawberries or cherries. Be sure to stay away from any sugar, as it will spike your blood glucose, making it harder to fall back asleep. When sleep is difficult, I truly believe that natural remedies may help, and they are far safer than sleeping pills of any kind. 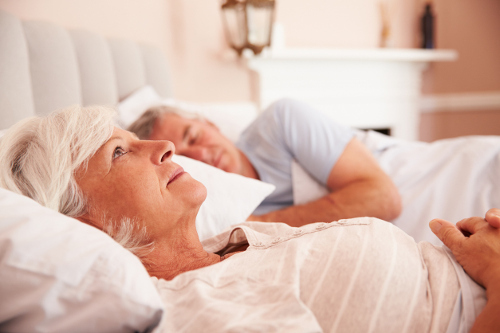 Insomnia affects your hormone levels and accelerates aging. It could also lead to diabetes, depression, and cancer, so it is important to treat it and keep it under control. While it may be tempting to turn to a pill for quick relief, natural solutions can heal the underlying problems and help you get to sleep more easily each night. However, if you are suffering from chronic insomnia and you’re unable to bring it under control with natural measures, be sure to consult your doctor about your options. “Food and Sleep,” National Sleep Foundation, December 2009; https://sleepfoundation.org/sleep-topics/food-and-sleep, last accessed April 18, 2017. Keefer, A., “Late-Night Snack to Help Sleep,” Livestrong, February 22, 2012; http://www.livestrong.com/article/555759-late-night-snack-to-help-sleep/.